Is it snowing in Serfaus ?ありがとうございました! Serfaus-Fiss-Ladis, in Austria (in the Tirol region), is a large connected resort with a total of 68 lifts (1 underground, 11 gondolas, 16 chair lifts, 40 T-bar lifts & conveyor belts) that offers skiers an incredible 1620 metres (5315 feet) of vertical descent. Serfaus has 1137 acres of terrain over 98 pistes. Serfaus is best suited to intermediate skiers and snowboarders but there is some terrain for beginners and advanced skiers. There are 30 kilometers (18 miles) of cross country ski trails at Serfaus-Fiss-Ladis. 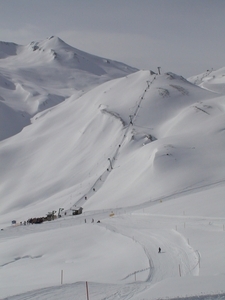 Most pistes at Serfaus-Fiss-Ladis are covered by snowmaking. 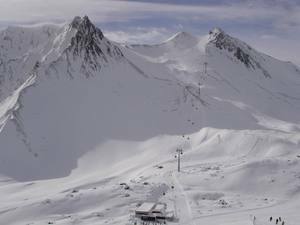 The nearest airport is at Innsbruck and the nearest train station to Serfaus-Fiss-Ladis is at Landeck. We arrived in Serfaus in mid-January and we were lucky enough to get some snow on the first day, on an otherwise poor snow season, so the slopes were decent at the start of the day. By the end of the day, however, you were skiing on ice on most of the busy connecting slopes linking Serfaus, Fiss and Ladis. The longest lines were about 10 minutes, but generally they were under 5 minutes. Unsurprisingly, you find the best slopes at the highest altitude: the Masner area at the left end of the map is absolutely great, when it isn't absolutely crowded (try going there at the start of the week, if conditions allow). The self-service Masner restaurant is conveniently placed at the bottom of all runs there. At the right-end of the map, the Frommesabfahrt piste no. 7 offers fantastic views and over 1000 vertical meters of descent. While we loved some of the slopes - 155 Masnerabfahrt, 160 Masnerkopfabfahrt, 7 Frommesabfahrt, 153 Masner-Alm-Abfahrt, 18 Schöngampabfahrt, we didn't love the transit routes between the various parts of the domain, which mean that you spent an average of two hours every day commuting on busy slopes and lifts. Given these drawbacks, it is worth going for "Skipass 6", which includes Kaunertal (lovely little glacier domain with fantastic views, rolling slopes, a tunnel and no lift lines, take the bus if you don't like snowy switchbacks) plus Venet (where you'll have the slopes to yourself), plus Nauders (with the longest run 3+1 and great views, also less crowded than Serfaus).